A private school on Dublin's southside attended by children related to the extended Hutch family is getting security advice from An Garda Siochana, in an alarming development that shows how the murderous feud is escalating from the confines of gangland to the heart of civil society. The principal of a private school in a South Dublin suburb has been liaising with gardai about security issues because of concerns over pupils related to the Hutch family, casting the shadow of gangland violence over parts of middle class suburban Dublin. The shocking revelation comes as new intelligence reveals that gardai have identified at least 130 people on either side of the gangland feud who have been caught up in the vicious gang war, many of them simply because they are relatives of key targets. Senior security sources believe that the violence has now reached a dangerous, chaotic and unpredictable level, with the Kinahan cartel recruiting low-level street dealers and drug users to carry out the killings in return for wiping their drug debts, or offers of money or drugs. Kinahan's gang have remained on the move since the vicious feud began, in anticipation of reprisals from Hutch associates. Four members of the Kinahan gang were believed to be holed up at a plush five-star hotel in Dublin this weekend. Yesterday the Minister for Justice, Frances Fitzgerald, revealed she will ramp up the powers of the Criminal Assets Bureau (CAB) to crack down on low-level dealers, in a significant intervention aimed at disrupting the cycle of killings from the ground up. The Sunday Independent has learned that while there is no specific threat at the private school, the indiscriminate nature of the attacks on the Hutch gang is understood to have caused enormous concern among the wider extended family. Most have no involvement in the war waged against certain members of the family and their associates by the Kinahan drugs cartel. Gardai are patrolling schools in the north inner city, where many of the extended Hutch family live. They are also patrolling schools in the south city stomping ground of Christy Kinahan's drugs cartel. 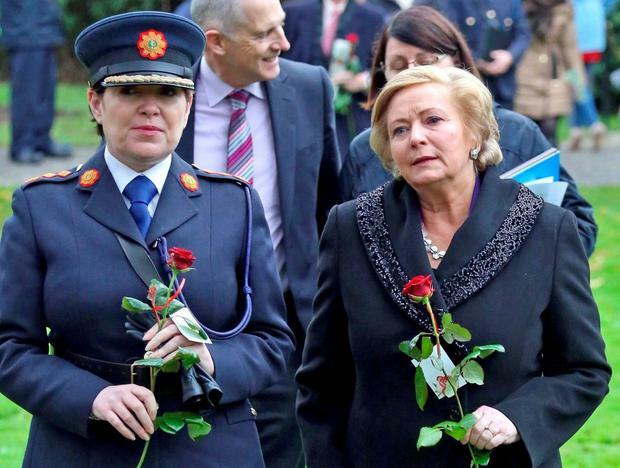 "Schools with a Hutch or a Kinahan are being included in Garda patrols. Gardai are there when the schools are opening and closing. It is part of the patrol," an informed source told the Sunday Independent this weekend. The gang warfare claimed its seventh victim last Tuesday when Gareth Hutch was shot outside his home in the inner city. He was the third member of the Hutch family to be murdered in the feud. Ms Fitzgerald said she will pass "zero tolerance" legislation in the coming weeks to allow gardai to target all assets worth more than €1,000 suspected of having been the proceeds of crime. The CAB can currently investigate assets over a €13,000 threshold. It is hoped the move will help gardai target drug dealers and addicts who are being kept on retainers and offered thousands of euro by gangs to murder their rivals. "We will review the CAB legislation to make sure it can deal with the sort of flaunting of assets that might be at a lower level among criminals but they are totally undermining communities. This could be in relation to cars, or carrying large amounts of cash," the Tanaiste said in an interview with the Sunday Independent. "There have always been prosecutions of drug dealing at every level where possible but we have to move towards zero tolerance models that work so well elsewhere." Ms Fitzgerald said she is "concerned" about the possibility of gardai or ordinary civilians being targeted or caught in the crossfire of the three-month long gangland feud. "This is a very dangerous situation and not to be underestimated by anyone. "We want to protect our police and we want to protect our communities. It is going to take very intensive policing," she said. She said the two crime families are prepared to take "unprecedented risks" including carrying out murders in broad daylight. According to Garda intelligence, around 70 members of the extended Hutch family and associates are caught up in the feud, the vast majority of whom live in a small radius in the north inner city stretching from Sheriff Street at one end to the North Circular Road on the other. Gardai have identified a group of around 60 people on the Kinahan side, including girlfriends, and at least two car dealers. In another development, the CAB is preparing an onslaught in the coming weeks against a string of properties and assets linked to the Kinahan cartel in Ireland. Officers with the bureau are planning to apply for a welter of asset-freezing orders. The CAB has already seized more than 40 luxury cars in Dublin, and €100,000 in cash and jewellery. According to sources, Christy Kinahan, the head of the cartel who operates out of Spain and Dubai, has few assets here and cash from his drugs enterprise is laundered through car dealers and beauty salons, while cash is wired abroad through legitimate front companies set up by professional business services. Gardai investigating the seven shootings have made 13 arrests, recovered 17 firearms, carried out several major search operations and seized property worth more than €1m. Some of those involved appear to be minor criminals, who are either under the influence of Kinahan associates in the capital because of their use of drugs, or who owe debts. Ms Fitzgerald said the gang war is "primarily a policing matter" but said she will be speaking to her counterparts in Spain and elsewhere about bringing the criminal gangs based abroad to justice. The gang warfare has also heaped pressure on Garda Commissioner Noirin O'Sullivan, who has faced a week of political turmoil over her handling of the controversy surrounding whistleblower Maurice McCabe. She came under sharp criticism from the newly established Policing Authority which raised concerns about the culture and management in the force following the publication of Justice Kevin O'Higgins' inquiry into allegations of garda malpractice in Cavan/Monaghan. Gardai investigating the murder of Gareth Hutch arrested three people on Friday who were still in custody last night. Gardai also arrested a man in connection with the murder of Michael Barr, who was shot dead in the Sunset House pub in the inner city.